One in three people over the age of 65 sustains a fall yearly. Every 14 seconds an older adult is treated in the emergency room for a fall. Every 29 minutes an older adult dies from a fall-related injury. As the general population ages, so too will the financial impact of falls on our society. In 2013, fall-related medical costs totaled $23 million (CDC). Reducing or eliminating falls is important to prevent injury, reduce medical costs, and eliminate the negative effects of falls such as depression, fear of movement, and isolation. “Proper footwear can help improve balance especially in older people who may struggle with mobility and balance issues,” said Dr. Matthew Garoufalis, a podiatrist and president of the American Podiatric Medical Association (APMA). Am I better off wearing shoes or not? Is it better for me to wear shoes with rubber soles? Should I wear shoes that support my ankle? In this article, we will try to answer these questions and provide the latest research on the best footwear for people with balance issues. WHAT IS THE STRUCTURE OF A SHOE? A shoe is made of upper and lower components. 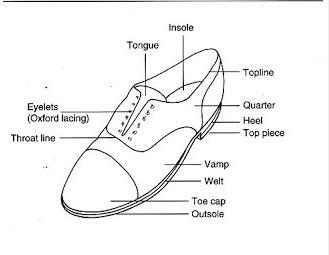 The upper component is divided into the vamp, quarter, toe box, throat, insole board, and topline. The lower component is the outsole, shank and heel. The upper component of the shoe is usually made of a variety of materials and is designed to allow the foot to breathe. The counter is a component of the upper that stabilizes the hind foot and retains the shape of the posterior (back) portion of the shoe. The counter can extend to support the heel and help prevent excessive pronation (rotation that is inward and downward). The toe box is the area the covers the toes and should allow room for the toes to move freely. 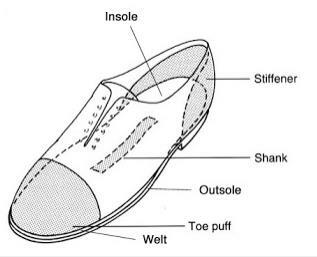 The lower portion of the shoe consists of the sole, shank and heel. The sole is divided into the insole and the outsole. The outsole should be waterproof, durable and possess some level of friction high enough to prevent slipping. The shank reinforces the shoe to prevent distortion of the shape of the shoe from regular wear. The heel is designed to hit the ground with each step forward. WHICH SHOES CONTRIBUTE TO INCREASED FALL RISK? Footwear has been identified as an environmental risk factor for both indoor and outdoor falls (Connell et al.). Somatosensory feedback to the foot and ankle are extremely important in balance and to prevent slipping or tripping. In a study done by Munro et al it was found that older people typically wear slippers because they are comfortable and can be worn without increasing discomfort from foot deformities. However, in a sample of 312 older persons, those who wore slippers had more foot pain and significantly greater fall risks compared to those who wore fastened shoes or no shoes at all (Mickle et al). In fact, numerous studies report that walking barefoot or wearing socks or slippers increased fall risk by up to 11 percent as compared to wearing athletic or canvas shoes (Koepsell et al). Most falls occurred in peoples’ homes (48%), where slippers are the most commonly worn footwear (Sherrington et al). Keegan et al found that slip on shoes, sandals, medium to high heel height and narrow shoes were also contributing factors to increased foot fracture from falls in people over 45 years of age (Keegan et al). Since wearing slippers or socks can lead to increased fall risk, it is recommended that you wear shoes even when inside your home. You may want to keep a specific pair of comfortable shoes for indoor use only if you are concerned about bringing dirt in from the outside. For people who must or prefer to wear slippers in the home, it is best to choose slippers that are well-fitting and have a closed back and non-skid sole. IS IT BENEFICIAL TO WALK BAREFOOT? Many people assume that walking without shoes would decrease their fall risk because it improves their ability to feel the ground. However, studies show this may not be the case, especially for older people who have worn shoes since childhood. Robbins et al noted that joint position sense was 162% lower in older individuals as compared to their younger counterparts, possibly due to an age related decline in proprioception (i.e. the ability to sense stimuli arising within the body regarding position, motion, and equilibrium). In addition, community dwelling older individuals tasked with walking on a 7.8 cm wide beam fell more frequently when barefoot than while wearing shoes (Robbins et al). This study demonstrates that when a persons’ balance is challenged they perform better wearing shoes than when they were barefoot. We can conclude from these findings that wearing shoes improves stability and reduces the risk of slipping. WHICH SHOES ARE SAFEST FOR PEOPLE WITH INCREASED FALL RISKS? It is important that your shoes are the appropriate fit. Due to painful feet, many people wear shoes that are too large (long or wide), which can lead to an increased risk of falls (Burns et al). Heel elevation has been associated with a greater risk of falling in older people (Gabell et al). Therefore, your shoes should have a low heel. It has been shown that shoes with a higher heel have a negative affect on posture, balance and gait, and are therefore associated with an increased fall risk. The recommendation is to wear a shoe with a heel height of 2.7 cm or less. Older people’s balance and positional sense awareness is worse in shoes with a thick, soft midsole (Robbins et al). Shoes with a soft sole caused more imbalance because people require more muscle activity to maintain their balance (Perry et al). Therefore, older people should wear a shoe with a thin, hard sole to improve foot position and optimize balance. The research regarding the benefit of a high top shoe vs. a low collar shoe remains inconclusive. It is thought that a high collar shoe will support the ankle joint and improve ankle stability. This has been found to be true in young adults performing multiple sports (Ottaviani et al). 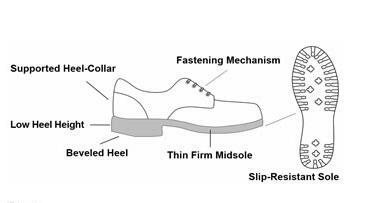 However, the research for high collar shoes for people with balance disorders requires further investigation. Gard and Berggard compared shoes with tread in different locations on the sole (whole foot tread, toe antiskid devices, and heel tread) and found that heel tread is best for reducing slips and trips. It was also found that a rubber heel with a bevel of 10 degrees provides greater contact with the floor and therefore improved slip resistance. Some older individuals feel that their falls are due to their feet getting stuck to the ground, possibly because they are not picking up their feet when they walk but rather slide them along. In this scenario, if the shoe provides too much friction, and so does the surface they are walking on, a fall could be caused by a “sticking to the ground” effect. If a person with a balance issue does not lift their feet off of the ground, they would benefit more by the ability to slide their feet along the surface. In this scenario, wearing shoes with a smooth surface may be the best option. Overall, the sole should have tread as well as a treaded beveled heel to prevent slipping on wet, slippery surfaces (Menant et al). Recent studies have shown that some insoles can improve proprioception and reduce falls. One product, called BalancePro, are shoe inserts with raised edges. These raised edges provide additional feedback to your body about your balance. In one study, users of the BalancePro insoles had 40% less falls than the control group. (Source: http://balancepro.ca). Our feet change over time. They may grow larger or wider, or we may develop painful bunions. If your shoes begin to feel uncomfortable it may be time to get a new pair, even if they are not worn out. It is a good idea to have your shoes fitted by a specialist in a shoe store to ensure proper fit. Better yet, establish a relationship with particular shoe store so they can get to know you, your feet, and your footwear needs. Shoe stores like The Walking Company, Richey Shoes and Shoes 4 Comfort stock good quality shoes that fit the recommendations for balance and stability. One way to find a good shoe store in your area is to do look for shoe stores that carry shoes such as SAS, Mephistos and Ecco’s. Click here to download the Footwear for People with Gait Imbalance publication.